Google has launched what they are calling Google Places, which is basically the Google Local Business Center, but renamed to Google Places. The new features they announced are below, but there are some neat things that I want to show you after this list, so keep reading. Service areas: If you travel to serve customers, you can now show which geographic areas you serve. And if you run a business without a storefront or office location, you can now make your address private. A new, simple way to advertise: For just $25 per month, businesses in select cities can make their listings stand out on Google.com and Google Maps with Tags. As of today, we’re rolling out Tags to three new cities — Austin, Atlanta and Washington, D.C. — in addition to ongoing availability in Houston and San Jose, CA. In the coming weeks we'll also be introducing Tags in Chicago, San Diego, Seattle, Boulder and San Francisco. Business photo shoots: In addition to uploading their own photos, businesses in select cities can now request a free photo shoot of the interior of their business which we'll use to supplement existing photos of businesses on Place Pages. We've been experimenting with this over the past few months, and now have created a site for businesses to learn more and express their interest in participating. 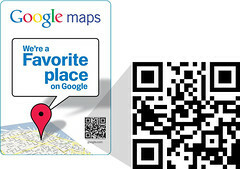 Customized QR codes: From the dashboard page of Google Places, businesses in the U.S. can download a QR code that’s unique to their business, directly from their dashboard page. QR codes can be placed on business cards or other marketing materials, and customers can scan them with certain smartphones to be taken directly to the mobile version of the Place Page for that business. Favorite Places: We're doing a second round of our Favorite Places program, and are mailing window decals to 50,000 businesses around the U.S. These decals include a QR code that can be scanned with a smartphone to directly view the mobile Place Page for the business to learn more about their great offerings. (2) Google launched a new help area outside of the Google Maps Help forum. The new help area is named Google Places Help. Yes, we will make sure to watch what takes place in this new forum. (3) I broke a story about Google Store Views a while back, and now it appears that Google is launching a form of this. Linda from the Google Maps team said in a Google Places Help thread that you can now apply "to have us [Google] come by to take pictures of your business." It is free, but Google will be selective. To apply, go to this page. (4) Brianna from the Google Maps team announced a new feature in the Google Places Help forum that lets business owners add discreet links to menus and reservations to their business page on Google Maps. To do so, go to your listing and in the "Additional Details" section of your Places account, simply add two columns labeled: (1) Menu and (2) Reservations. 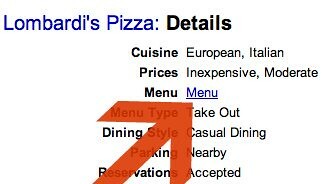 Then add the URL of where you host your menu or reservations. Those are four tidbits I wanted to highlight about this new announcement. Forum discussion at Google Places Help, WebmasterWorld, & DigitalPoint Forums. Previous story: Google Indexing Content Via Referral Logs?